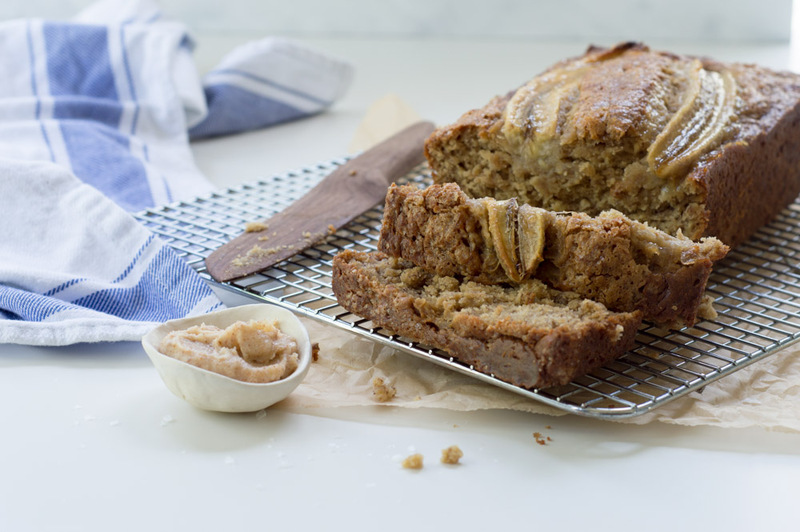 Gosh, can banana bread ever be bad? I don’t think so; there’s so many different recipes out there for banana bread, so many different variations. I don’t think you can really go wrong when you make it. (I mean… I know there’s probably some out there that are crap but the majority is great!) There’s something we always end up doing, okay, I end up doing. I think I’m going to eat bananas or I think I’m going to have smoothies for breakfast so we buy a ton of bananas. 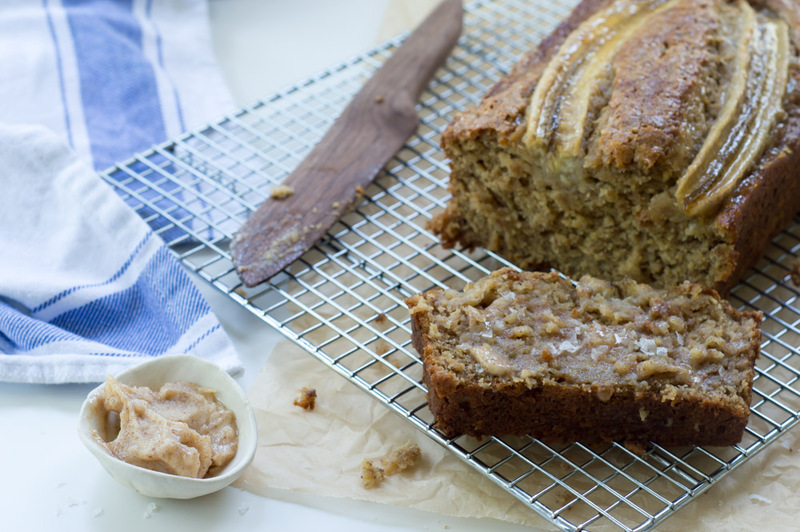 Do I subconsciously have in the back of my mind that I want banana bread? Probably. 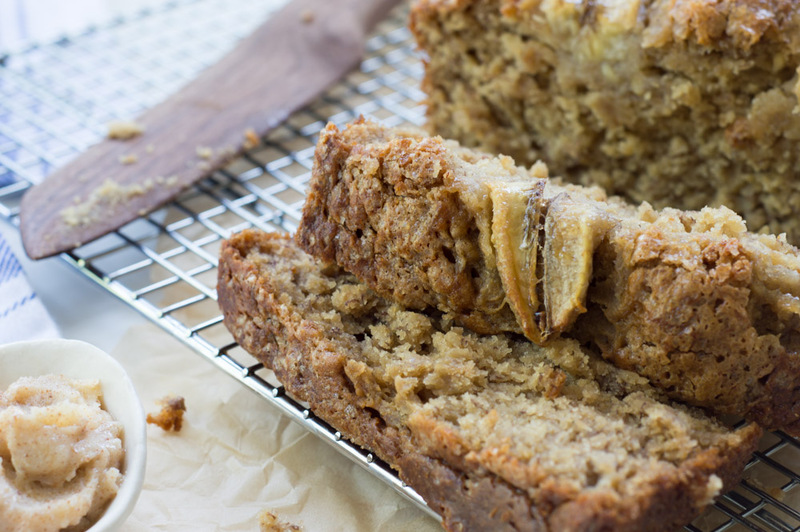 The one time I bought bananas to ripe on the counter for banana bread, I ended up eating them all before they got ripe, ha! So if there’s so many recipes out there, why create another one? The answer is brown butter, and honestly I want that to be my answer for everything in life. Brown butter makes everything better whether it be savory or sweet. The intentions are to always eat off of the bread for a few days, buuuuut what ends up happening is it’s consumed over the course of a day between the gentleband and I. The other things I did that I found pretty special are fresh nutmeg and I spread browned butter and Maldon sea salt on each slice I had, hello, that salt, don’t skip salting your slice! Oh, also I added raw sugar, not only generously to the top, but to the pan after I greased it and before I poured the batter in. That caramelized crunch on the outside of the loaf, delicious! ∙In a stand mixer with a whisk attachment, mash your bananas. You want to have them well mashed, this helps with the texture and making the bread moist. ∙Add in dry mix and just slightly whisk until a little combined. Remove the bowl from the mixer and mix the dry ingredients with a rubber spatula. Again, this will help with texture. 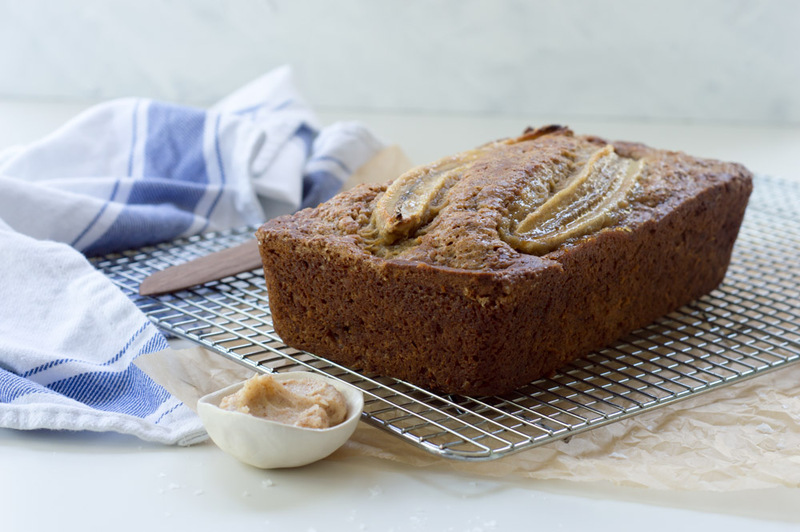 ∙Pour batter in and top with a sliced banana and more raw sugar! ∙While this bakes, I usually brown a little extra butter. Once it’s done browning, I place it into the fridge to congeal again. I want it to be spreadable like softened butter. Add this to your slice along with flaky sea salt! DO IT!